iOS: Starbucks has had a mobile app for a while, but it didn’t offer much more than keeping track of card balances and looking up stores. But its latest iOS version allows you to pay for and order coffee in advance, skipping the line at your local shop. If you already have a Starbucks account and a linked card, setup is really easy. You just download the app, then login with your credentials. If you don’t use a Starbucks account, you’ll have to create one and link a new card, or, if you have a Starbucks gift card lying around, you can link that. From there, just tap on “Order.” You pick your store, then pick your drinks and food. You can customize your oder, of course, and then pay via the app. It then tells you when you can expect your drink to be ready. 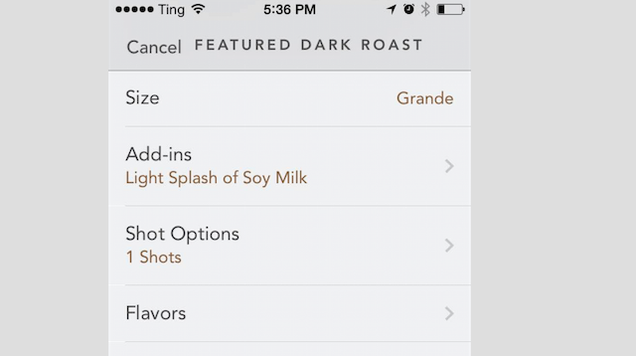 The app also remembers your frequently ordered drinks and customizations. The function is still in beta, so it’s pretty basic, but it does the job. It’s a fun feature, and probably works best for customers in busy areas. Give it a try for yourself at the link below.